By Worshipful Malcolm W. Swan. "Twenty-six years ago it was in the hearts of two Master Masons, Maynard H. Boyden and Chester B. Gove, that there should be and could be a Masonic Lodge in Walpole. After several meetings of these two, it was decided to invite other Masons to meet with them. There were over one hundred Masons in Walpole who had not affiliated with either Orient or Saint Alban's Lodges because of transportation or other reasons. "Many meetings were held after this date at which all matters were discussed as to a name and also a tentative list of officers to serve under dispensation. Bro. Samuel A. Clinch suggested the name Azure and it was accepted and adopted. "After careful inquiry it was discovered that there was not a Past Master among the Masons who had signified an intention of becoming a Charter Member. It was suggested that Rt. Wor. James A. Hartshorn of Norwood be asked to join and serve as our first Master. Brothers Herbert M. Bonney, Maynard H. Boyden, Fred A. Hartshorn, Jr., and Winslow E. Holmes were appointed as a committee to visit him and obtain his answer. He accepted, and on September 28, 1921 at 8:00 PM Rt. Wor. D. D. G. M. Arthur W. Chase to the Twenty-Fifth District called the gathering together and read the dispensation of the Grand Lodge of Massachusetts authorizing the instituting of Azure Lodge. Rt. Wor. D. D. G. Marshal J. Fayette Stone conducted the following to their stations: James A. Hartshorn, Worshipful Master; Winslow E. Holmes, Senior Warden; John G. Glen, Junior Warden; Willard E. Everett, Secretary; Charles E. Barrett, Treasurer; Rev. Percy E. Barnes, Chaplain; Eugene P. Christiansen, Senior Deacon; Maynard H. Boyden, Junior Deacon; Ralph S. Howland, Inside Sentinel; Clarence E. Shirley, Marshal; William F. Corkum, Tyler. "At a meeting October 26, 1921, Bro's Leroy C. Gardner, Willard E. Everett, and Walter D. Crowell were appointed to prepare By-Laws for the Lodge. "At the tenth Regular Communication under dispensation on September 21, 1922 a committee consisting of Bro's. Winslow E. Holmes, John G. Glen, and Harold L. Goddard were appointed to arrange for the Constitution of the Lodge. "At the tenth Special Communication under dispensation on October 11, 1922 the following officers were elected to serve after Azure Lodge should be constituted: Winslow E. Holmes, Worshipful Master; John G. Glen, Senior Warden; Maynard H. Boyden, Junior Watden; Charles E. Barrett, Treasurer; Willard E. Everett, Secretary; Ralph S. Howland, Senior Deacon; Harold L. Goddard, Junior Deacon; Herbert M. Bonney, Senior Steward; C. Eugene Hartshorn, Junior Steward; Evans F. Spear, Inside Sentinel; Clarence E. Shirley, Marshal; William F. Corkum, Tyler; Mott D. Brown, Organist. Thus was Azure Lodge conceived and born. The constitution of any Masonic Lodge is a notable occasion and Azure's was no exception. Prior to the ceremony, dinner was served to 230 Masons in the original Bradford Lewis Hall. The ceremonies of the evening took place in Odd Fellows Hall which is still our meeting place. During the early years the Regular and Special Communications were very busy with degree work on many candidates. Affiliations were very prevalent and one occasion is worth mentioning. On February 25, 1931 seven Masons joined Azure Lodge. The following month, March 25, 1931, an Affiliation dinner was held, attended by 130 Masons. "March 3, 1934 — Special Notation"
"We of this generation are well acquainted with the catastrophe that befell our Lodge during the early hours of this day, when our Lodge quarters in the I.O.O.F. building were completely destroyed by fire. So that a permanent record may be had for later years our Master has requested that a special entry be made in our minute book. "The only items this Lodge has tonight are our Charter which has been kept in the safety deposit vault of the Walpole Trust Co.; the Secretary's records — minute book and financial books which were in his home and the Treasurer's record book for the years since 1925. "All our regalia and furnishings were completely destroyed — in hunting among the rubbish of the Temple wt have found a few mementos which may be of interest at some future period, namely — part of the head and a short bit of the handle of the Master's gavel; the four door knockers; the jewel from the Secretary's collar; the remains of the Master's tall silk hat; the badly-burned and water-soaked remains of the volume of Sacred Law presented to Azure by Past Master John G. Glen a number of years ago; the name plate from the "Point within a Circle" presented by Bro. Eugene O. Christiansen; the rough and perfect ashlars were also dug from the debris, none the worse for their experience. Your Master, Senior and Junior Wardens and Secretary have prepared this day an inventory of what our equipment was, with its value, and presented it to Bro. Harry A. Whiting through whom we had placed an insurance policy of $1000. against loss by fire. "Also, you will note from our minutes of Feb. 28th, 1934 that we approved this bill of Bro. Whiting's for $15.50 for insurance on our equipment, and our Treasurer came down to the fire with the check in his pocket, dated March 2nd, 1934. "On Tuesday, March 6th, 1934 your Master and Secretary met with the insurance adjuster, Mr. G. F. Stratton, and settled the insurance loss of $900. "Offers to Azure Lodge for the use of their Temple and Regalia were received from Wor. Bro. Ernest May of Orient Lodge, Norwood and from Wor. Bro. Eliot French of Blue Hill Lodge in Canton, by phone, within a very few hours after the fire." The invitation extended by Orient Lodge was accepted and Azure Lodge met in Norwood until June of 1935 when, the I.O.O.F. Building having been restored, the Lodge resumed meeting in Walpole on September 25, 1935. The other Lodges in the Hyde Park 25th Masonic District were very generous in contributing to the replacement of regalia which had been lost in the fire. On October 8, 1947 Azure Lodge had reached 25 years of age and celebrated with a Special Communication. The Lodge-room bulged at the seams and Most Worshipful Samuel H. Wragg, Grand Master, with a large Suite from Grand Lodge, helped us to observe this notable occasion. (1947 Mass. 324-326) It is interesting to note that three of his Grand Lodge Officers were Wor. Laurence E. Eaton, Grand Sword Bearer; Wor. Andrew G. Jenkins, Grand Pursuivant; and Rt. Wor. Whitfield W. Johnson, Grand Marshal. Later on, each of these Brothers became Grand Master. Six Past Masters of Azure Lodge have served the 37th Lodge of Instruction as its presiding Master, namely: Rt. Wor. John H. Peebles, Sr., Wor. Charles A. George, Wor. D. Emerson Everett, Rt. Wor. Malcolm A. Pitts, Wor. Richard K. Drake, and Wor. Malcolm W. Swan. Certain phases of Azure Lodge's history seem to go by two's. Two brothers have served Azure Lodge as Worshipful Master for two years: Wor. Winslow E. Holmes and Wor. Burgess P. Reed, Sr. Wor. Bro. Holmes was Master the year Azure Lodge was constituted and also during the following year. Wor. Bro. Reed was Master during two years of World War II when several of the line officers were in military service. The Grand Master has seen fit to appoint two Past Masters of Azure Lodge to be District Deputy Grand Master of the Hyde Park 25th Masonic District: Rt. Wor. John H. Peebles, Sr. was appointed in December, 1937 and Rt. Wor. Malcolm A. Pitts was appointed in December, 1957. The Grand Master has deemed two members of Azure Lodge suitable recipients of the Joseph Warren Medal for distinguished service: Bro. Howard F. Everett received his medal on October, 26, 1938 and Rt. Wor. John H. Peebles, Sr., on April 28, 1965. On April 25, 1945 Bro. Evern Hilton had the unique Masonic pleasure of proudly watching as his four sons were raised as Master Masons in Azure Lodge. On June 23, 1954 Bro. Alexander Hood received a Tyler's jewel honoring his thirty-years as Tyler of Azure Lodge. Brother Hood was also very active as ritualist during many of these years. For many years, one of Azure Lodge's annual activities has been a Children's Christmas Party. This has been a source of excitement and joy to the children of many members. On November 30, 1960 Azure Lodge held its largest meeting during its fifty years when the Walpole High School gymnasium was turned into a Lodge-room. This was Shrine Night at Azure Lodge with the Aleppo Temple Shrine Band and Chanters present. Two hundred and thirty-nine Masons dined in the school cafeteria previous to the degree activity. 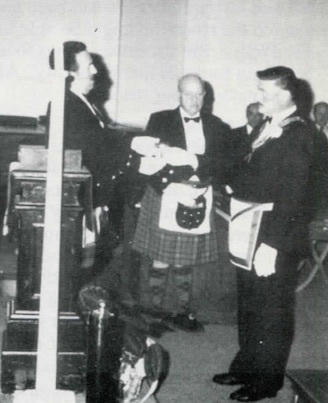 1960 also saw the first time that a son of a Past Master of Azure Lodge became its presiding Master. Since that time three other similar situations have occurred. Azure Lodge seems to be coming into maturity. The 1962-63 Masonic season saw the first of a series of improvements in our Lodge quarters when we voted to acquire a Hammond Electronic Organ. This instrument has contributed greatly to the enjoyment of our Communications. During the 1963 — 64 season two well-known curious artificers presented Azure Lodge with a hand crafted charter case and a beautiful illuminated letter "G" to adorn the East. The first three officers of the Lodge entered into serious negotiations with Reliance Lodge, I. O. O. F., our landlords, with an eye towards further improvements to the Lodge-room. These negotiations resulted in wall-to-wall carpeting and several other improvements, with expenses being shared equally by Azure Lodge and Reliance Lodge, I. O. O. F. The Lodge-room was now noticeably quieter and, recalling leather soles and heels on a wooden floor during the Master Mason degree, much safer. 1964 was the high point in membership during Azure Lodge's first fifty years of existence with 271 members in good standing. 520 Master Masons have signed the By-laws of Azure Lodge as of this date, but, as our last Special Communication for degree work was in 1962 we, in common with many Lodges, have shown a decline in membership during recent years. The conscientious Master tends to worry about the attendance but, if he will consult the annual reports of some of our early Past Masters, he will find they had similar problems and their observations about these problems are almost identical to those of more recent Past Masters. During the 1964—65 season we acquired new sideline seating for the Lodge-room and our landlords provided foam rubber cushions for the seats. The sidelines suddenly became much more comfortable! This was the first year that the Annual Installation was held on a night other than the regular meeting night. This season also saw the Lodge undertake its first corn roast, an enjoyable affair which has become an annual event. A program to show Past Masters the advantages of making arrangements for the eventual return of their Jewels and Aprons to Azure Lodge was also inaugurated. This program has been moderately successful because four of our recent Past Masters are wearing pre-owned Jewels and Aprons. In June, 1965, Rt. Wor. John H. Peebles, Sr., retired as Secretary of Azure Lodge, having served in that office for twenty-six years and five months. The following November Azure Lodge voted him as the first Honorary Member. In 1968 the Lodge voted to confer Honorary Membership, consistent with the Constitutions and Regulations of the Grand Lodge and the By-Laws of Azure Lodge on members who hold or are eligible for the fifty-year veteran's medal. The details of our history are, of course, interesting. Fifty years ago today this lodge was constituted. The names of our members and the record of activities as our Lodge has progressed through the years are a source of pleasant reminiscence. Our history records survival in difficult times and gFOWth in more favorable days, both of which are worthy accomplishments. But unspoken in the record is the debt which we here tonight owe to our Brothers who preceded us. Their dedication and Masonic labors cannot be catalogued but we know that by their efforts Azure Lodge has flourished for fifty years arid has provided the light of Masonry to hundreds of Brethren. In conclusion, visiting Brethren have been heard to observe "This is the friendliest Lodge I have ever visited." Let us continue to deserve that description. Wor. Peter Buchanan hands the gavel to newly installed Wor. Peter Connor. To the tune of its bagpipe band, the Kilwinning Club of Boston installed the officers of Azure Lodge, Walpole, with Wor. Peter Buchanan, team manager of the club, as the installing officer. Wor. Alex McHoul was the installing Chaplain and Peter Stewart the installing Marshal. The public ceremony was well-attended by Masons and friends. Peter Connor was installing Worshipful Master, Warren Pezold as Senior Warden, Donald Brennan as Junior Warden, Albert Miller as Treasurer, James Fisher as Secretary, Wor. James Manninen as Chaplain, Wor. Malcolm Romans as Marshal, John Forbes as Assistant Treasurer, Wor. John Piatt as Assistant Secretary, Wor. David Hugulet as Senior Deacon, Daniel Coyne as Senior Steward, Steven Nye as Junior Steward, Roderick Bruce as Organist, and William Anderson as Tyler. The Kilwinning Club is comprised of Masons with Scottish ancestry and was formed in 1924 to visit lodges to install officers or to perform degree work. 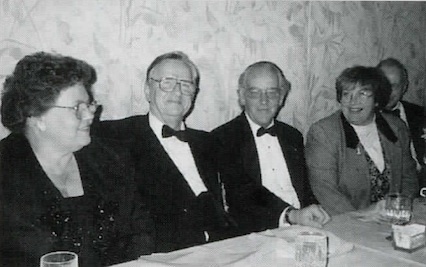 On October 22, 1997, Azure Lodge of Walpole celebrated the 75th Anniversary of its founding. Over 120 Brothers gathered at Bernardi's Restaurant in Walpole to share a prime rib dinner and reminisce about their years in Freemasonry. Most Worshipful Arthur E. Johnson, Grand Master of Masons in Massachusetts, and a distinguished suite of Grand Lodge and District officers, including R. W. Robert Steadman, Deputy Grand Master and R. W. James B. Kershaw, D. D. G. M. Hyde Park 25th District, were honored guests. A highlight of the evening was the Grand Master's presentation of the Joseph Warren Distinguished Service Medal to Wor. Donald J. Brennan. Azure Lodge has several special events in the planning stages to mark its Diamond Jubilee. Important among these was a CHIP event. Last November 15, parents and children thronged the Walpole Mall to participate in Azure Lodge's Child Identification Program (CHIP). Officers and members of the Lodge prepared videotapes of the children. Walpole Police officers. Sgt. Fred Leland and Detective James Dolan of the Walpole Police Department, made fingerprint records of each child to go along with the videocassettes. The Walpole Mall management graciously provided space for the event. Brothers from Bristol Lodge who had experience in staging the CHIP event assisted the Azure team. R. W. James Kershaw. D. D. G. M. Hyde Park 25th District, was present for review and encouragement. "The program was a great success; Joseph Duggan, Senior Warden, did an outstanding job organizing the event for us," said Wor. David Huguelet, Master of Azure Lodge. During the three hours the program ran, two video cameras were going continuously and 120 children were videotaped. M.W. Arthur E. Johnson, Grand Master and his wife; Wor. David Huguelet, Master and his wife. This page was last modified on 30 April 2018, at 14:40.